An upstart domestic snus maker sees the market future among cigarette smokers who want to cut back, but not quit, and has tailored its product and marketing accordingly. In addition to its �reduce your smoking� argument to cigarette smokes, American Smokeless Tobacco has focused on two specific areas, packaging and flavors, to further distinguish its snus from the Philip Morris and R.J. Reynolds entries. Both Discreet and Pro come in resealable, metallized foil zip pouches that measure approximately 3 1/2 inches square and containing 12 bits. �It�s a lot more convenient vehicle for the product,� explains Bruce, �especially when you�re marketing to smokers, somebody who�s got a pack of cigarettes, a cell phone, a wallet - he doesn�t really want another big box to put in his pocket.� Since the product doesn�t necessitate a large package, American Smokeless elected to go in a different direction than Philip Morris or R.J. Reynolds and emphasize convenience and not be pigeon-holed with competitor�s formats, like the puck or tin. The Discreet brand presents a classy, upscale design and is offered in Full Flavor, Cool Mint, Wintergreen, Peach, and Strawberry. 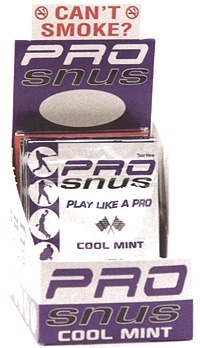 Pro Snus, in addition to more traditional styles like Full Flavor, Green Ice, and Cool Mint, is available in Wild Peach and Wild Grape, with a product presentation geared toward a younger, 21- to 35-year-old male audience. �We have broadened the flavor horizon. We have seven flavors,� explains Bruce, �and we feel the market would expect that. People have different tastes. They don�t just want a cool mint, a spearmint, or a wintergreen.� For a new category trying to win over first-time consumers, it certainly seems wise to offer a range of flavors and limit the potential appeal of the product. American Smokeless Tobacco isn�t unique in this approach among new contenders hoping to carve market share as the category grows, but Bruce is convinced the public will ultimately expect and demand such choice in flavors. Add value pricing to the equation, and Bruce believes Discreet and Pro give consumers a purpose as to why they should try this snus. 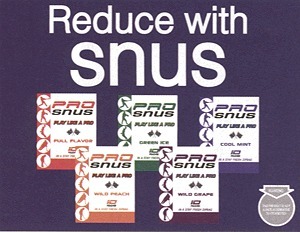 All snus makers continue to confront the domestic smoker�s pre-conceived notion that oral tobacco is �dip.� While Camel has chosen to specifically label its snus as �spitless,� American Smokeless Tobacco avoids the terminology entirely so consumers don�t erroneously make a connection with dip. The company has even trademarked the slogan �Join the Snus Revolution,� a reflection of its belief that snus is indeed the future of tobacco. American Smokeless Tobacco Co., South Boston, Va., Toll-free: (866) 241-8259, Fax: (866) 245-5458.